Since their a big win against the Lions on Monday night the Jets head into their home opener flying as high as recent memory allows. Behind Sam Darnold’s stellar coming out performance in Detroit earlier this week, Jets tickets for their season opener against their 1-0 AFC East rival Dolphins are up 12% on the secondary market. 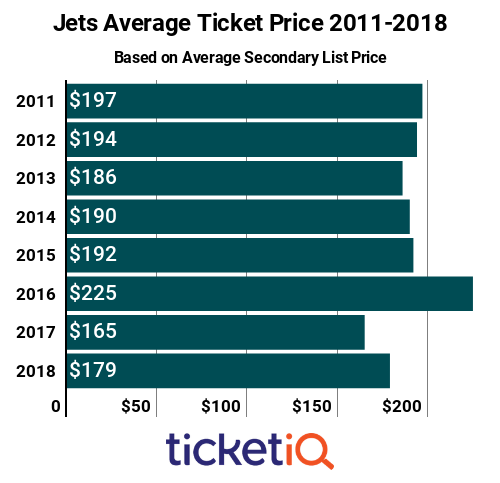 Overall season prices for 2018 Jets tickets on the secondary market are up even more, having gone up 15% this week across all home games at MetLife Stadium, with prices starting from $30-40 for most games. The Patriots game on November 25th is the most expensive game with prices starting at $90. In comparison to other New York events, a ticket to see the Jets will be a great value this season. Watching Darnold progress in the team’s West Coast offense behind an improved offensive line, would be well worth the price of admission. Single-game tickets on the primary market are available for all games, though they are limited for both the November 25 New England and December 23 Green Bay games. But fans can get into MetLife Stadium to see a game against Houston for less than $30. For secondary market listings, TicketIQ offers a Low Price Guarantee for all of the games listed below. As on the primary market, the Patriots and Packers games are the priciest – both games have average asking prices of more than $200 on the secondary market – but great seats are available for all games. You’d think we’d all have Patriots fatigue by now, but the Boston-New York sports rivalry continues to thrive. Surprisingly, neither the Patriots nor Dolphins games are the most expensive this season at MetLife Stadium. That honor goes to the Packers, who, though not the Jets biggest rival, are always a big draw. The teams have played 12 times with the Jets holding an 8-4 advantage. 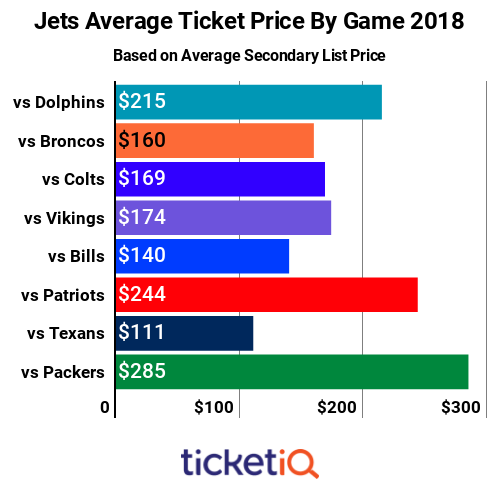 Prices for that game will rise or fall depending on whether or not the Jets are in the playoff hunt.